Surprisingly a good read! I have read all of the Stephanie Plum books and have begun to not enjoy them as much, as they are very similar. I have also been finding the whole love triangle to become monotonous. 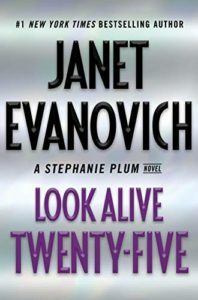 So, having read a whole pile of suspense crime novels this year, I’m not sure if that changed my perspective on the book, or if I was sick of the love triangle so wasn’t interested in that side of the story, or if Janet actually did a good job of writing a suspense book. With all of the past books I have cared more about her love life and was always focused on that and didn’t care too much for her bounty hunter career. But, this book seemed to focus purely on one main crime. Not a pile of smaller criminals, or her family (disappointingly almost nothing from Grandma Mazur), barely anything on Morelli and Ranger – apart from how they were protecting Stephanie, no mention at all of financial worries from Stephanie, no blowing up of cars. In fact, possibly that is what made this book a good read – it was focused purely on one crime, instead of a pile of smaller sub plots. Part of me is curious to reread some of her other books to see if the crime part is as well written and engaging, or if I was too focussed on the love triangle to appreciate it. But the bigger part is not yet ready to walk that path again. I give this book 4 stars. As a stand alone suspense crime book, it would probably only rate 3 as it is a fairly straight forward plot, however the suspense and the mystery is quite good plus I do still have a loyal and sentimental soft spot for this Stephanie Plum series. Well done Janet, I was getting ready to give up on you and this series, but you’ve reeled me back in with this book. Share the post "You have redeemed yourself Janet." I’m in the middle of this one right now… poor Hal was just relived of his duties at the deli. It definitely feels different than the others. I just finished it and agree that it had a bit of a different feel to it. Have any of these books ever ended like this one, with the plot for the next one so clearly laid out? Happy Cannonball! I’m glad to hear this book was better than many in the series (I gave up with book 13).